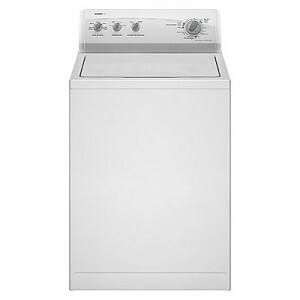 The Kenmore White Top-Load Washing Machine w/ Spanish Control Panel (2052) has a 3.5 cu. ft. capacity, which should be just about right for people who are looking for a washer with ample load capacity. Couples and small families will definitely find the washer very capable. Hispanic users with Spanish as their mother tongue will find the Spanish Control Panel absolutely helpful. Small loads can be finished in less than 30 minutes. The machine is equipped with a wide array of wash cycles: 4 normal cyles, 8 heavy duty cycles, a cycle for whites, for permanent press and 4 delicate cycles. The usual load in these tyes of washers is increased with the help of the Dual Action® Plus agitator. Special cycles include express wash. The washer has an extra rinse cycle option, great for sensitive-skinned people who want to make sure their clothes do not have any detergent residue. This washer is equipped with a bleach dispenser. This washer has 5 water levels available. This washer is equipped with Automatic Temperature Control (ATC) which provides appropriate wash temperatures depending on wash cycle selected. The wash basket is made of white porcelain so it effectively resists odors and scratches. The machine has a Dual Action Plus agitator that allows you to wash a total of 16 bath towels in just one load. The washer is colored white, which looks classy and timeless. The control panel has Spanish controls, enabling Spanish speakers to easily use it. The control panel is also easy to figure out. The compact design allows it to be easily placed in any location. Load balancer, leveling legs, power cord and hoses for filling and draining are included. Total Volume: 3.5 cu. ft. The washer has a Spanish control panel, allowing for Spanish users to easily operate it. The features are basic, but the cleaning power of the washer is exceptional. The design of the washer is compact, so there is no diffulty in placing it in confined spaces. The washer has rotary controls which make it more friendly-looking to users. The unit's energy and water efficiency allow for savings in utilities. Compared to other top load washers manufactured before 2004, this washer saves 32 percent water and 48 percent energy. his model offers value for your money because of its nifty features and capacity. The washer is only equipped with a bleach dispenser, while detergent and fabric conditioner dispensers are not available. Some users do not like the lack of a soak option. The controls can be a bit old-fashioned for most people who prefer a digital display and push button controls. Express Wash option allows for small loads of laundry to be finished in a short time. Comments for Kenmore White Washing Machine w/ Spanish Control Panel (2052) 3.5 cu. ft.
Kenmore doesn't make anything. Your only course of action is to find out who made your washer and what is their model number.